They aren’t thinking about you! So sorry, most people really aren’t thinking all that much about you. Remember the time you were humiliated because you stumbled? Or you wore two different shoes? Or you had a stain on your clothes from that wonderful burrito? Heck, I still remember being 16 and all gangly, walking right into a telephone pole while the boy’s football team rambled by in a bus! We all still remember those moments. But… most people (you included) will see something weird and say, “Hmmm, she has a stain on her shirt. That’s gonna upset her when she gets home.” And then they forget about it. Why? Because they have too many things on their plate to worry about. You aren’t high on their list. Ok, I’ll concede that sometimes things wind up on the internet. (I’m so glad we didn’t have that when I was a teen!) But most of those disappear quickly because thousands of other people are doing silly things, too. I was in South Dakota for a reunion and I walked into an art store filled with wonderful Midwestern paintings. The artist in residence is John C. Green, and he has a sly sense of humor. On his wall is the fake deer’s head pictured above. He was entertaining himself and people in the store by having the deer head talk with them. It was corny, but still funny. Two women were looking at a painting. One said, “It’s beautiful, but it depicts a hunting scene. 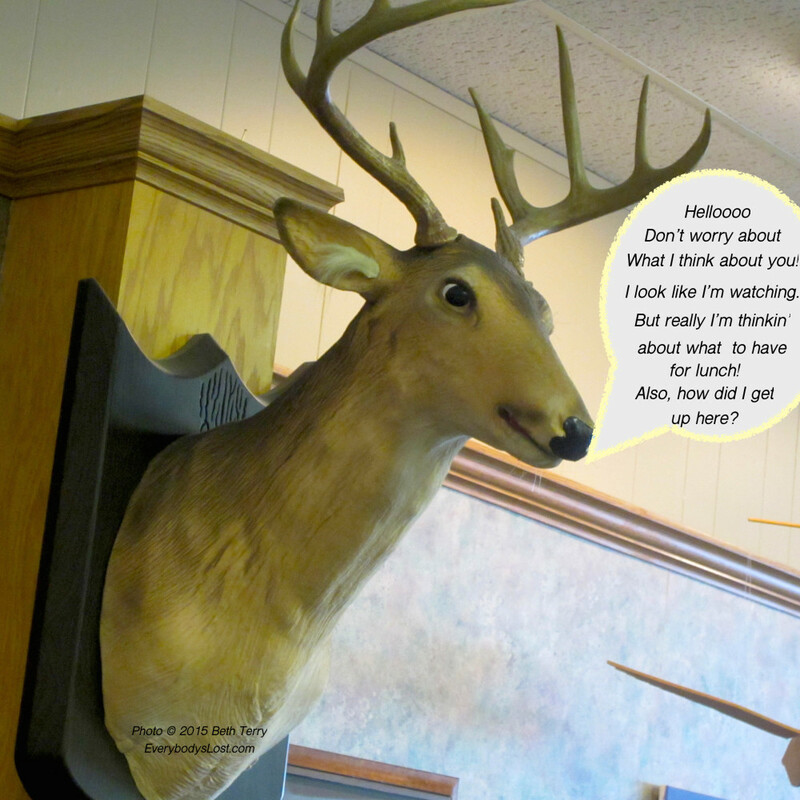 What will people think?” John’s deer head let out a chuckle and told them nobody’s thinking all that much about them. It was a perfect moment of good old Midwestern practicality. It applies to most of us, I would guess. A lot of us get caught up worrying about what others think. A good question to ask yourself is, “Am I that important to them?” Answer: Probably not. Just be you. Enjoy Life. Laugh at yourself and move on. Turtles all the way down – Not the Big Bang!